Unpack the history and culture of South Africa - one of the world's most beautiful and interesting countries - with Unpacked: South Africa. The book takes you on a journey through this incredible country, from its food to wildlife and its art to sport. The bright, fun scrapbook design will engage children's attention and capture their interest, making the book the perfect introduction and travel guide. Explore South Africa's rich history, from its tribal past, through colonization, right up to the present day. Meet the 'big five' safari animals: the lion, the African elephant, the leopard, the rhinoceros and the Cape Buffalo, plus lots more incredible wildlife. Discover the Springbok passion for all things sport, from rugby and cricket to football, swimming and cycling, and find out why their sports teams are among the best in the world. See the sights in South Africa's three capital cities: Pretoria, Bloemfontein and Cape Town. Explore South Africa's diverse and interesting landscape - from veld to coast, deserts and rivers. Read all about Nelson Mandela, who many consider to be the founder of modern South Africa, and the apartheid era he fought to end. Discover the unusual meats South Africans love to feast on, from ostrich to crocodile and antelope! Find out all about the treasure that exists underground in South Africa, from gold, silver and copper to dazzling diamonds. Uncover the history behind some of South Africa's most exciting festivals and holidays, such as the 'Second New Year' held every January in Cape Town. 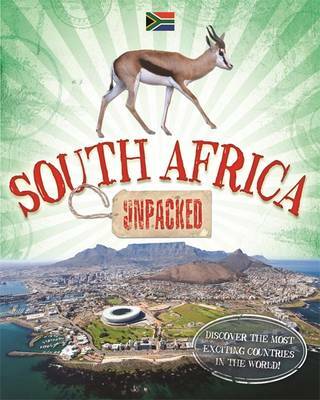 Unpacked: South Africa is packed full of fun, quirky facts and interesting information, perfect for children aged 9 and above. Whether you're planning a trip, or just interested in the country, this is the guide for you! South Africa is just one of the world's most fascinating countries. Why not unpack Australia, Brazil, France, Italy, India, Portugal or Spain in other titles in the series?